Back in 2008, I wrote up one of Bob Laughlin's most colorful sets, a 32-player "Diamond Jubilee" collection honoring the American League's 75th anniversary. Card number five commemorates Frank Robinson's debut as player/manager for Cleveland, which he topped off with career homer #575. My original write-up claimed Diamond Jubilees came with blank backs, which proved wrong wrong wrong. Laughlin actually included a note about each AL honoree, "Diamond Cards" sketch logo, and card number. (Hard to be #5 without it, right?) With all apologies to Mr. Robinson, the updated post now includes both scans and an updated description: 1976 Laughlin Diamond Jubilee #5. Here's my favorite modern Robinson card. 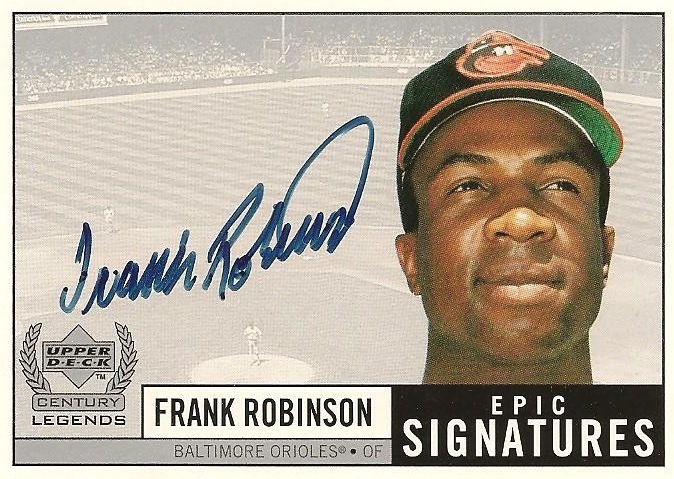 Nice auto and good close-up--that's some smoooooth card action.